Palmyra steadily declining in numbers as farmers slaughter the Asian Palmyra palms for firewood in the bricks kilns. Thrissur: Palmyra trees, which are the cultural and geographical icon of Palakkad district, are fast becoming a rarity. 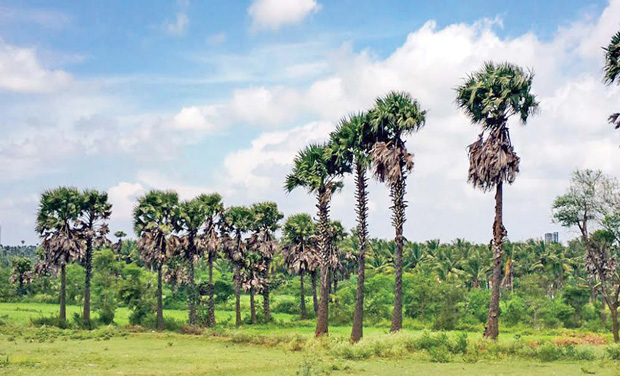 The tall palms with their fan-shaped leaves are steadily declining in numbers as farmers slaughter the Asian Palmyra palms for firewood in the bricks kilns. The shift to other crops, difficulty in finding tree climbers and the disappearance of the once-thriving palmyra-based industries have spelt the death knell for the Asian palmyra palm, scientifically known as Borassus flabellifer, says Dr V. B. Sreekumar, a scientist at the Kerala Forest Research Institute. Growing up to 30 metres, the hardy species is known for surviving extreme heat conditions and live up to 100 years. Observing that the palmyra is largely disease-free and required little or no maintenance, Dr Sreekumar suggests that it could be promoted as a key species to combat global warming and climate change. Palmyra tree has cultural, heritage and literary association to Palakkad. Many novels, stories and poems revolve around these trees, says novelist TD Ramakrishnan. “The path-breaking Malayalam novel by O. V. Vijayan, Khasakkinte Itihasam mentions palmyra trees from various angles. Many people especially in eastern Palakkad once lived on earnings by tapping palmyra toddy,” he says.